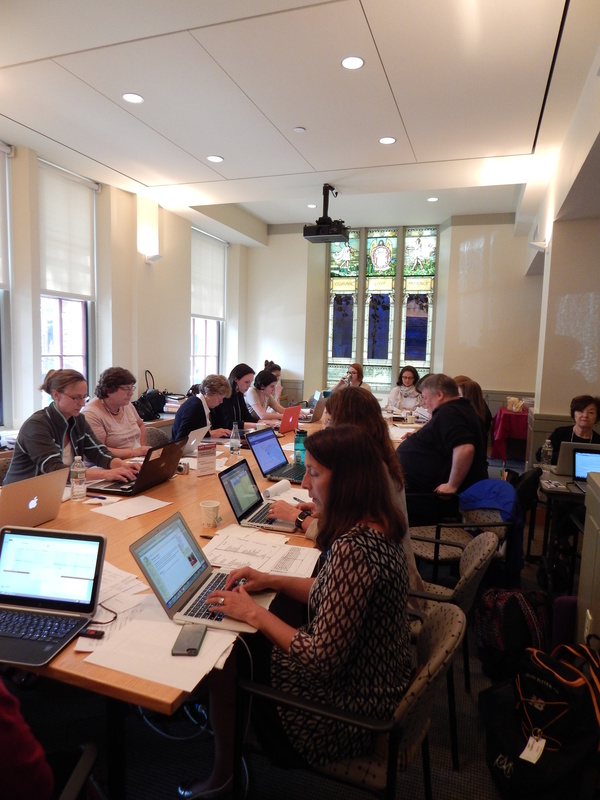 I recently attended a weeklong workshop on analyzing historic cookbooks. We studied a variety of cookbooks from England and America from the 1400s to the early 1900s. Barbara Wheaton, a noted cookbook historian, designed the workshop as an independent study workshop. Each day we had a theme (ingredients, workspace and tools, etc.) and were to carefully study the cookbook assigned for that day to ask questions such as: where did the ingredients come from: the local marketplace, the garden or other domestic setting, or hunting? Where they imported? What role did seasonality play in when ingredients would be available (and how did this change from the 1400s to the 1900s)? How long would it take to prepare the ingredients? Did the chicken come ready to drop into the pot or did it need to be killed, defeathered (I’m not a farmer–I’m sure there is an appropriate term for this!) and then put into the pot? I was surprised at how much I learned from listening to my fellow workshop members report on their assigned cookbook and how they asked questions of the cookbook and the interpretations and conclusions they arrived at after careful study. The same applies to genealogy. As an example, let’s take a closer look at the newspaper article that started me asking more questions about Levi Savage. The article was pulled from the Library of Congress Historical Newspapers section (a wonderful resource) and was published on February 14, 1899 in the Salt Lake Herald (pg 6). Several questions comes immediately to mind. Why are all these claims before the government? Was there a new act put into place by Congress or some other government entity that invited claims? If so, why? What made one eligible to receive a claim? Just what were these “Indian depredations”? When did they occur? 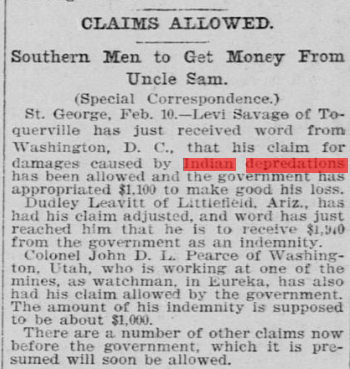 I thought that in the late 1800s Toquerville was a pretty safe place to be–could it be from sometime before he moved to Toquerville in the 1860s, or perhaps from the early years living in Toquerville? What other questions would you ask just by reviewing this newspaper article? The next set of questions are what leads to a research plan.What do I want to know? I want to know the details of the claim, as well as the circumstances that led to the claim, including when the incidents supposedly took place. I would also like to acknowledge that there are at least two sides to this story and I want to learn more about the history and what the Native Americans were doing (and what the whites were doing to them) at this time. Then I ask what additional sources can I examine? Are there resources, such as records and/or employees at the National Archives that could help me figure this out? What about family records? Maybe using the Serial Set of Congressional Records? In terms of learning about the general history I could start with my local library and see what they have. Since I live in Boston and the events occurred in Utah, they may not have much. I can also turn to local university libraries, or to repositories such as New England Historic Genealogical Society. As you may know from previous posts I already have some hints. Levi’s son writes in his autobiography about losses due in part to Indian raids in the 1860s in Millard County in Utah. I have found some mentions of Levi’s claims in the Serial Set, and have a contact at NARA who is an expert on anything involving Native Americans and the government that I can email when I pull things together. I have yet to put together a true research plan. That will be my next post. In the meantime, please let me know what questions you would ask of this document, and which questions you have asked of documents you came across in your research, and where finding the answers to those questions led you. DearMYRT coined the phrase “pinball genealogy” in a recent post. When I first saw the title (and before reading the post) I came up with my own definition: not having any type of research plan in place and jumping from clue or clue, or document to document, with no thought of where I might go next. DearMYRT’s definition goes in a slightly different direction. She writes that pinball genealogy is bouncing from document to document “without fully considering the info each contains.” (emphasis added). Whether using my definition or hers, the problem is the same. Key clues about identities and relationships are missed, and the hit or miss approach leads to not fully searching and evaluating the relevant records. Research plans help avoid this mistake. Research plans are critical to any type of research. They help identify research goals, clarify what is known, identify resources that need to be examined, and help keep track of additional sources we find in our research. They also help keep us focused and organized. The objective: Objectives should be simple and focused. Good example of objectives include: Finding the marriage date and place of my paternal grandparents, or locating the birthplace of my maternal grandfather. Researching the entire life of my maternal grandmother is much too large of an objective. In order to bring this to fruition, a series of objectives and related research plans must be explored. Summary of what is known: One of the first things told to beginning genealogists is to start with what you know. See what is around the house, or in the files of your great-aunt, who is the family historian. The same applies with research. Starting with what you know (even if it’s just family lore that has yet to be proved) can give you clues to start. For example, if you know that the first child was born in 1902, a likely date to search for a marriage would be 1900 or so. Sources to examine: Once you have written what you know, it’s time to start thinking about which sources might be of help. Would a federal or state census provide information? Are church or vital records available online, in a repository, or on microfilm at the Family History Library in Salt Lake City? Is a published genealogy available? Identify all sources, along with relevant call numbers or URLs and include them in your research plan. Research Strategy: Come up with a plan to examine all the sources listed above. This plan could include dates by which a specific resource will be examined, or could group resources in like places (such as within the same county) together so that you can visit them all on the same day. Many people find it helpful to go to the online catalog of a library or other repository you are planning to visit and build a research plan from what is available there. This ensures that when you are at the repository that you can put your time to the best use, since you have already identified the resources to examine and written down the call numbers ahead of time. As you go through the resources you have identified, accommodate new resources that you become aware of, and add them to your plan. How have research plans helped you in the past?